The 3602 blower from Koller with built its powerful yet surprisingly quite 640W motor is encased in a unique vertical body making this blower great for installations into tight spots as it can be mounted either horizontally or vertically. Controlled electronically it will connect to your spa or bath control box and be operated via the top side control. Or connect it to a PNEUMATIC 3 SPEED CONTROL BOX giving you the option to have a 3 speed blower controlled via an air button. Standard 1.50" buttressed connection provides a wide range of union options. 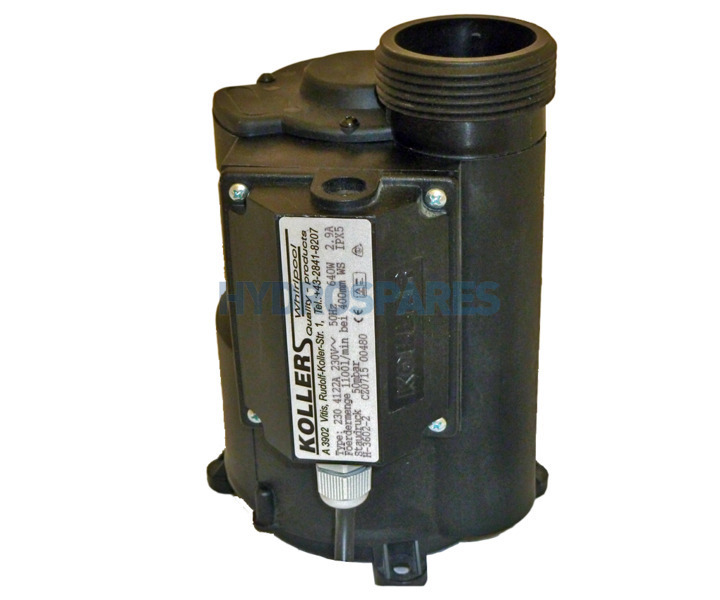 Blowers will usually always plug into the control box of your hot tub, bath or spa. They are supplied with a bare cable so it's a good idea to re-use your original cable for easy of re-fitting to the control box.